The wedding packages listed below are adaptable to any of the venues we offer, all of which are situated on or near the scenic shores of Lake Tahoe. While our most affordable venues are suggested in the various options, any of the prearranged packages may be applied to another location of your choice, although additional site permit fees may be applicable. You may also make additions to the preset packaged items if you require other services that are not already included, such as limousine or professional videography services. 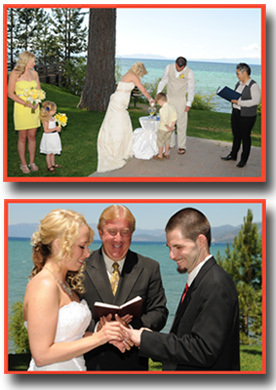 Offering the desired essentials assures that you will attain the beautiful Lake Tahoe wedding you envisioned. Our Tahoe Elopement Wedding Package is the most affordable deal for the bride and groom who want a modest and inexpensive ceremony. 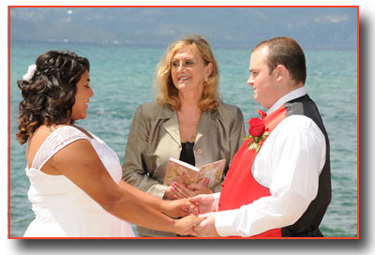 Just obtain a California marriage license from any county clerk’s office in California and enjoy your wedding at the water’s edge on Lake Tahoe’s Beachfront. As the name implies, our Simple & Sweet Package is for the bride and groom who want a simple ceremony. This plan includes the added convenience of our minister issuing the marriage license at your selected ceremony site on the day of your wedding (Logan Shoals excluded). Your simple and sweet affair can take place at any of our listed venues, but our most economical occur at the water’s edge on the Beachfront, on the elevated bluff of legendary Emerald Bay, along the beautiful shore of Regan Beach, or atop the rocky precipice at Logan Shoals (other location choices may incur additional site permit fees). Enjoy with your Couple’s Choice Package everything that’s offered in the “Simple & Sweet” package above with the inclusion of a professional photographer. Capturing the sentimental moments of the event, your ceremony will be digitally photographed in addition to formal shots taken of you and your guests afterwards. As an option, if a different ceremony setting is preferred other than one of the four optional locations in the package above, you may instead choose your own ideal venue to host your special event (additional permit costs may apply at other venues, so select the particular place of interest for exact pricing of our Couple’s Choice wedding package). 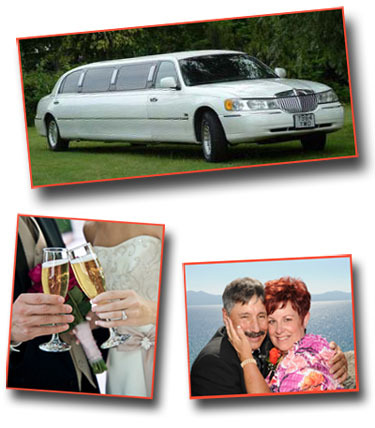 The Tahoe Queen Wedding Package is for the couple who wants it all. Simply select your preferred venue from our diverse list of wedding sites and enjoy the benefits of everything included in our Couple’s Choice Package listed above with the addition of classy limousine service to and from your selected wedding location, a beautiful six rose bridal bouquet with matching groom’s boutonniere, an enhanced photo session with virtually limitless photos, champagne and toasting glasses for a celebratory toast after the ceremony (an excellent photo opportunity), and editing of your digital images. The enhanced photo session allows our professional photographer to capture all the intimate moments of your event, including the first champagne toast you have together as newlyweds. A majestic wedding arranged with ease by means of a phone call. As an added bonus to your Tahoe Queen package, at your request, we will promptly post a select edited photo of your favorite posed picture to Alpenglow Weddings Facebook page to provide instant viewing of your wedding day by family members and friends who were unable to be in attendance for your special occasion. Enjoy a romantic and intimate vow renewal formality near the water’s edge on the sands of the Beachfront. Or, as a second option near the Beachfront, you and your guests can gather on the elevated wooden deck that faces outward over the water. If preferred, you may also choose another location from our list of available sites (additional site fees may apply, but guest limits typically will not be applicable). See what brides and grooms say about their wedding day experiences!